bless us with the gift of Conception. bless us with the magic of Intention. the moment when one cycle ends and another begins. Aho. So may it be. bless us with the gift of The Quickening. bless us with the gift of Expectation. bless us with the Promise of the new growth. and the gestating life kicks within the womb. ~ Hope that our prayers will be answered. ~ Hope that our intentions will come to pass. ~ Hope that our desires will be fulfilled. bless us with the gift of Birth and Rebirth. bless us with New Beginnings. bless us with the gift of Germination. as vitality returns to the world. ~ Joy that the darkness has past. ~ Joy that a new day has begun. ~ Joy that our paths have become clear. bless us with the gift of Nurturing. help us to Kindle our Desires. bless us with spirit of Cultivation. amidst playfulness and sensuality inspired by fragrant blossoms. ~ that we may be Passionate in living. ~ that we may be Passionate in loving. bless us with the gift of Fledging. give us with Drive to pursue our goals. bless us with the gift of Flourishing Life. of light and warmth and energy. ~ Determination to overcome obstacles. ~ Determination to become who we are. bless us with the gift of Maturation. bless us with the gift of Reflection. bless with the gifts of First Fruits. ~ Recognition of who we are. ~ Recognition of our calling. ~ Recognition of our place in the world. bless us with the gift of Elderhood. bless us with the gift us Fulfillment. bless us with the gifts of the Great Harvest. as we celebrate our Abundance. ~ Wisdom from all of that we have witnessed. ~ Wisdom from all that we have done. ~ Wisdom from all that we have been. bless us with the gift of Transition. bless us with the gift of Plowing Under. as you open the Veil between the Worlds . 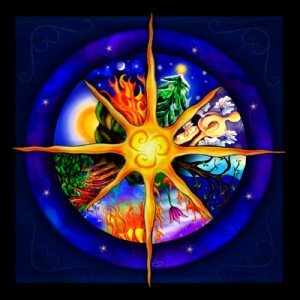 Within you the wheel of the year is complete. Each ending is a new beginning. into the fabric of the future. Embedded within each of the invocations are 8 different cycles, all of which have correspondences with each other. Even though a cycle is a seamless continuum, there are distinct, identifiable phases during each cycle. 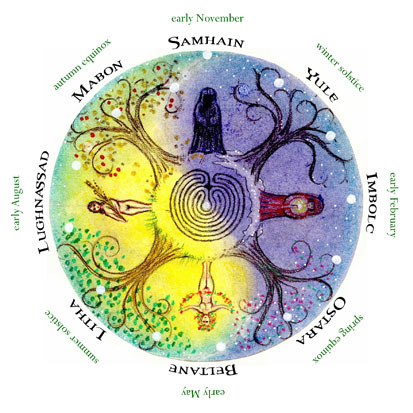 The invocation honors those phases. For some purposes this invocation may be too long and too formal in tone, so I invite you to have fun with with this and adapt as you see fit. Make it your own by subtracting what doesn’t resonate, and adding phrases that fit your sensibilities. 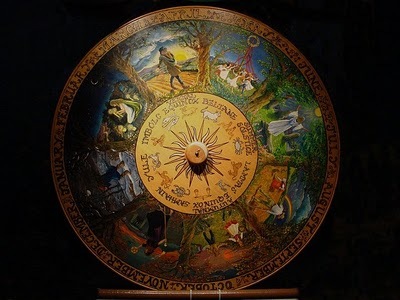 The images of the wheel of the year at top are from the following websites, which will provide more information on the wheel of the year and 8 earth rituals.